After realising that the current CPD planner wasn’t producing effective results for Learning Assistants, Germaine Mckinnon, Assistant Headteacher at Braunstone Frith Primary School, reviewed their training and development process. She decided that it could be facilitated and made more successful with the use of IRIS Connect. IRIS Connect: What challenges and objectives led you to start using IRIS Connect with your Learning Assistants? Germaine: A CPD planner had been devised for Learning Assistants based on good and outstanding criteria for learning support – this was to allow Learning Assistants to begin to track their own CPD. However, it was not initially obvious how it would be used to support ongoing professional development. I was given the brief to look at Learning Assistants training and development and how it could best be facilitated using IRIS Connect. We have very experienced and dedicated Learning Assistants in school who are always keen to receive feedback and to improve although they often think that CPD is only about going on external courses, which, as research suggests, have very limited impact in school. After seeing significant results when using IRIS Connect to support the development of our NQTs, we considered taking the same approach with our support staff. There had previously been success when the Learning Assistants had in-ear coaching, so we knew there was value in it. Using IRIS Connect, therefore, seemed an obvious way to bring together all of the school’s needs and priorities. IRIS Connect: How are you using IRIS Connect with them? Germaine: All 36 of the Learning Assistants in school are involved. There is a full range of personalities -from those who are keen to get started, to those who are more reluctant and in need of support, as well as a small minority who still have not yet made a reflection. We worked with Mike Fleetham and set aside training sessions specifically for the Learning Assistants, each one with a clear focus. The first session introduced the kit for those who had never seen or used it before and their first task was to record a 15-minute self-reflection. The second session showed them how to reflect on the videos – sharing, editing and making comments. The final session focused on how IRIS Connect could be used by them was linked to the targets on the CPD planner. IRIS Connect: What impact has the work with IRIS Connect had on the Learning Assistants so far and how do you hope to see them developing in the future? 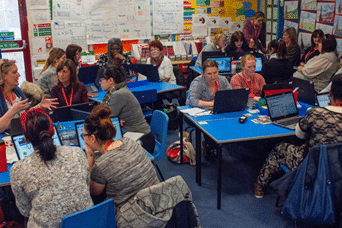 Germaine: A recent survey of the Learning Assistants has shown that they are confident using IRIS Connect and can see the benefit of using it to improve their professional practice. They have been very positive about the feedback they have received and have used the tips and advice they have been given. Some of our Learning Assistants use the equipment with minimal prompting and are keen to share their reflections with trusted others. Equally, when a video is shared with them, they offer feedback and are generally very positive. In the future, it would be fantastic if they could contribute videos to the Teaching Library Group that we have built in IRIS Connect because they feel confident that their practice is exemplary. IRIS Connect: Has their work with IRIS Connect changed their relationships with other staff? If so, how and do you see this developing further in the future? Germaine: The Learning Assistants are usually comfortable to share their videos with their class teachers, but are still quite shy about sharing wider than that. Some Learning Assistants do share with other teachers, however, and specifically request feedback on areas of their practice which they have identified as a focus and some others are even prepared to share reflections with the whole school. Relationships have improved within the Learning Assistants group, but there is still some work to do on establishing improved relationships across teachers and the Learning Assistants. IRIS Connect: What impact has this all had on the learners so far? What impact do you hope to see on the learners in the future? Germaine: The Learning Assistants can see that using IRIS Connect benefits the children they work with. They are often responsible for teaching in small groups and the most effective use for them has been through the use of questioning and behaviour management. Being able to watch and reflect on their practice has allowed the Learning Assistants to make simple tweaks to their teaching such as positioning in the classroom, sharing roles with other adults in the room, planning questions and keeping the children on task and engaged more effectively. IRIS Connect: What are your future plans for IRIS Connect? Germaine: To continue with the CPD planners for Learning Assistants and identify personalised targets. There has been 1-to-1 coaching using IRIS Connect reflections, with identified Learning Assistants, which will be rolled out to the rest of the support staff in the future. We are currently creating a Teaching Library Group of in-house exemplar lessons to meet the CPD needs of all staff and we hope that the Learning Assistants will be brave enough to contribute to this as well. The use of IRIS Connect is part of the whole school improvement plan and it is key to the progress and development of the school.